Everyone seemed to have a fun time guessing the Harry Potter characters in my Harry Potter alphabet before I posted a key, so I thought I would do the same here. Have fun! By the way, two of the letters are identified by their races, not their character names. (EDIT: Key now available at the bottom of the post in white text). Love your work. Big Muppets fan, originally know you from ToughPigs, bought your Muppet Alphabet shirt, etc. Thought I couldn't appreciate you more than I already do, but then you go posting this set on my other most influential work of media. Awesome. I would have preferred N to be Kira Nerys instead of Neelix, but that's just because I haaaate Neelix. A great balance of the different series and movies--another fantastic artwork, Mike! Thanks Quinn. I tried to incorporate a suitable mix of each Trek franchise. I feel the same way about Neelix, but he ultimately seemed like the most recognizable choice, especially since I wanted to represent Voyager again. I had also thought about Seven of Nine (but, as much as I wanted to include the Borg somehow, she seemed like more of an S than an N) or Nero (to include the latest film). I only wish you had incorporated Troi or Torres as T instead of Tribbles. I mean, tribbles are great and iconic and all but there's far too few women in here already and I grew up loving both of them (and Dax and Kira...). Maybe I'm bitter cuz of all these great women it's Yar who's represented and I can't stand her. 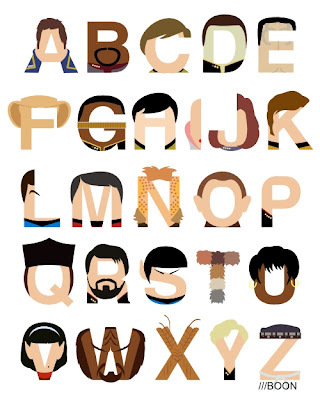 :P (But Uhura, duh, amazing). Thanks for the feedback. T was literally the last letter I did. 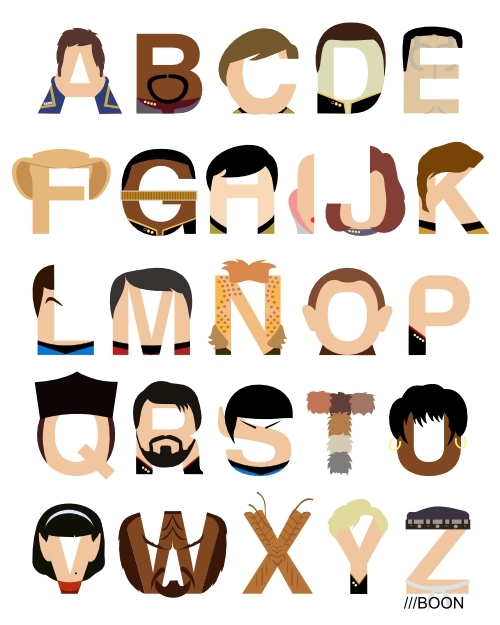 I was torn between Troi and Tribbles, but I couldn't get Troi to work well as the letter. I had also really hoped to include the Borg Queen in there somewhere as well but I couldn't cut B (a captain) or good-old Q.